NASHVILLE, Tenn. – Murray Manuliak, a driver for Bison Transport was named the winner of the Truckload Carriers Association’s (TCA) Company Driver of the Year Award. (L-R) Brad Holthaus, Murray Manuliak, Garth Pitzel, Jon Archard. 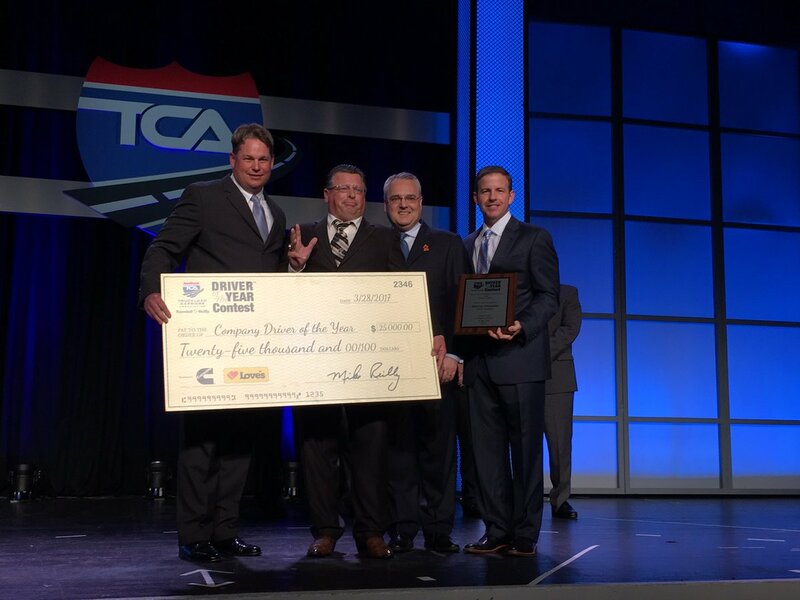 The award is one of two grand prizes the TCA gives out at its annual Awards Banquet as part of its Driver of the Year Contest that honors one company driver and one owner-operator. It recognizes professional drivers who are safe, enhance the public image of the trucking industry, and make influential contributions to their communities. Essentially, the winners of the award represent the utmost professional drivers in the industry. Manuliak has been driving trucks professionally for more than a quarter century, accumulating more than 3.1 million consecutive accident-free miles. He is an in-cab instructor for Bison and takes part in Manitoba’s Truck Driving Championships. David McGowan of WEL Companies and William Poteet of Saddle Creek Transportation were the runners up in the company driver award category. The Owner-Operator of the Year Award went to Gary Buchs, a driver for Landstar System based in Jacksonville, Fla.
Over his 27-year career, Buchs has accumulated more than 2.3 million accident free miles. He has also earned a 10-year safe driving award and is committed to charity as he spends at least one week per year helping victims of wind or flood damage. Runners up of the Owner-Operator Driver of the Year Award included Philip Keith of WEL Companies and Kevin Kocmich of Diamond Transportation System. The grand prize winners took home a $25,000 check as part of the award, while runners up received $2,500.